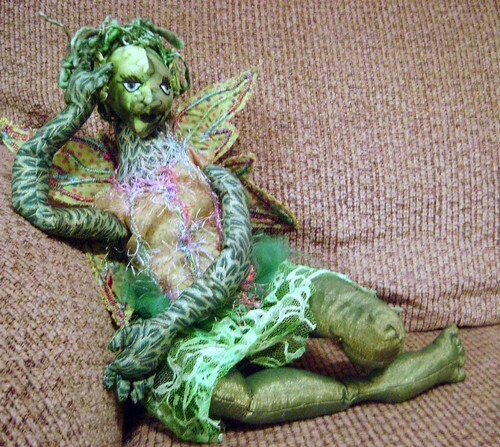 This little Tree Sprite is finally finished… let’s review her creation. Originally created for the Mythology Show of December 2005! I started her body and had plans to make her a Medusa based doll. She sat HEADLESS for all these years, because frankly the heads are difficult in this medium and I got interested in other things and time moved on. She has sat on the shelf by my sewing area, so it is not as if she hasn’t been staring at me, headlessly, pleading for me to finish her. Then there was the WIP show from this same time last year. So I entered her in that show more as a guilt trip for myself to finish her. But it has taken a whole year for it to happen. The wings were created this past Christmas as I made doll clothes for my nieces’ dolls. I wanted to make them both fairy costumes for their dolls, because they are really into fairies right now. I had some extra trial wings leftover so I decided this doll needed to be a fairy instead of a Medusa. The reason it has finally happened, is that I made a goal for myself to finish up and clear out all of my half-started projects. I even made a calendar determining which ones I would finish when, and how they might apply to a show. This entry was posted in Fiber Goodness, Passions and tagged doll, EBSQ, Fiber Goodness on February 22, 2009 by Sheba. 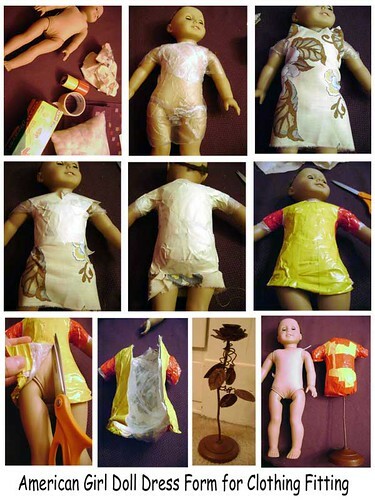 Based on some instructions for making a duct tape dress form, I used Enchy’s doll to make a mini doll dress form. First, I wrapped the naked doll in plastic wrap. Then I covered it with a piece of fabric. This was to represent the t-shirt that is used in the sample instructions. Next using masking tape I did one layer of tape around the fabric. Mostly I used this type of tape because I knew I would not have enough duct tape and because I thought it would be more flexible for this small dress form. Next was a couple layers of duct tape, I added some partial sleeves at this point. Now I had to carefully cut the tape off the doll without damaging the doll. I cut up the front and up one sleeve. The other sleeve came off without cutting once I had enough give to pull it off. I taped the cut lines closed. I had some old candle sticks that I never use that I realized were the perfect size to be a stand. yippiee! I cleaned off the wax and dust, clipped off the leaves and put it up the middle of the duct tape form. I stuffed the form with recycled stuffing that I get from Charger’s destroyed toys. I taped up the bottom and I am done! I was thinking about covering it with some nice fabric, but that will add more bulk, which will make the dress fitting less accurate. At this size mere fractions of inches will throw off all the measurments. The layers of tape and fabric already make the fitting a little different from the actual doll. It doesn’t need to be pretty… Perhaps when the girls don’t need doll clothes made for them anymore I will cover it and make it an artsy dress form sculpture that is not meant for the fitting function. This entry was posted in Fiber Goodness, Pastimes and tagged American Girl, art, doll, doll clothes, dress form, Fiber Goodness, sewing, tutorial on December 17, 2008 by Sheba.